In a large food processor, combine the peas, basil or mint, garlic, California Dry Jack cheese, lemon juice, red pepper flakes and salt and pepper. 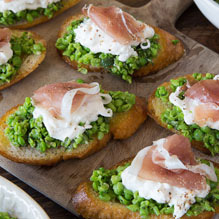 Slather a few tablespoons of the pea pesto on top of the crostini. Add a tablespoon or two of California Burrata cheese and then garnish with a piece of prosciutto.